Competitive free diving is one of the purest watersports but also one of the most dangerous; centring on pushing the human body to its limits, forcing out the boundaries of endurance and lung capacity. What is Competitive Free Diving? 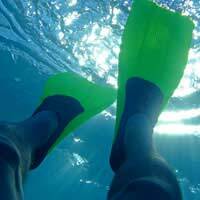 Free diving is the activity of underwater diving without any underwater breathing apparatus. The competitive sport is an intense discipline where divers compete to attain the greatest depths, times or distances on a single breath. It is an extreme test of lung capacity and physical endurance. Competitive disciplines vary according to how they are assisted whether this be with fins, weights, a rope or nothing at all. ‘Constant Ballast’, which is where the diver is completely unassisted, is the most respected and ‘truest’ form although it is not the deepest. ‘No Limits’ is the deepest form of free diving and although - with its weight and inflated lift bag aids - it requires the least physical exertion of the disciplines, it demands the greatest mental control. As an extreme sport that centres on pushing the body beyond its traditional limits in an environment where it is not designed to go, free diving is unsurprisingly fraught with danger. Lung squeeze, nitrogen narcosis (or ‘the bends’), ear perforation and drowning are some of the many perils a free diver faces. One of the most feared and unpredictable dangers of free diving are blackouts, and in particular, the shallow-water blackout, or samba as it’s known to free divers. This is where, on the return ascent, the brain shuts down within 15 feet of the surface. When diving the water pressure squeezes the lungs, condensing the oxygen, giving what feels like a second breath, but on the ascent the lungs re-expand causing the oxygen to disperse. If not enough oxygen reaches the bloodstream then shallow-water blackout occurs. The laryngospasm reflex temporarily prevents drowning by tightening the throat and keeping out water. This allows a last ditch effort to save the blackout victim. This is just one potential incident that exemplifies why a diving buddy is essential. There are three main important risk-minimising rules for any free diver that wants to return to the surface fit and able. Dive with a friend or ‘diving buddy’, who can keep watch and help if trouble arises. Due to the risks and skills involved in free diving it is advisable to take an AIDA International approved course before beginning. Breath holding sessions, which teach breathing and relaxation techniques. Dynamic ‘apnoea’ (the suspension of external breathing) sessions, where horizontal underwater swimming is practised. Theory sessions, which teach students the basics of free diving physics and physiology, how to prevent shallow water blackout and how to rescue a free diver in danger. Diving sessions, which include the practise of rescue procedures, technique training and streamlining. By the end of the course students are expected to be able to dive comfortably to a depth of between 16 and 20 metres. Free divers are fit, strong and healthy athletes that look after their bodies. For all disciplines of free diving, strong muscles and excellent cardiovascular fitness are important. Cardiovascular fitness is the key to efficient respiration and breath holding skills, and means that when oxygen and carbon dioxide are exchanged in the lungs no oxygen is wasted. Muscular fitness is important in being able move about effectively underwater, often against strong pressures. The body has its own in-built protection against the dangers of free diving in the form of the mammalian diving reflex. Immediately when a mammal submerges its face into water the reflex is triggered. The reaction maximises the time that can be spent under water, enabling the body to better endure water depth and lack of oxygen. Free diving demands a cool disposition. Those anxious about the feat that awaits them will never succeed. Fear releases adrenaline, which in turn raises the heart rate, constricts blood vessels and causes quick, shallow breathing.